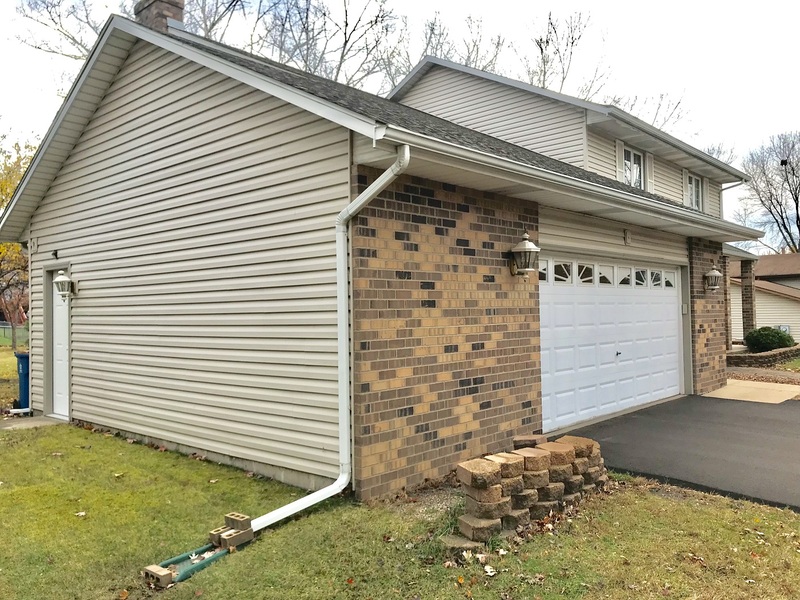 When Wayne asked our gutter company to visit his home in western Bloomington, it was because he was in search of the best gutter guard for his three car attached garage. Two decades earlier, he’d had open style gutters installed after a metro-wide hailstorm destroyed the exterior of his home. Discouraged by the amount of organic debris clogging his gutters each season, it wasn’t long before he opted to have a topper device installed on several areas on his home, although not his garage. As time passed, the trees surrounding his garage had grown in stature and he wanted further information on products that would allow him to forego gutter maintenance. Wayne wanted to make certain that the product he chose was an enhancement to the curb appeal of his home. Lastly, he wanted feedback on how we could address the streaking he was noticing on his home’s fascia boards. Having spent the past 48 years in insurance counseling, Wayne appreciated that when he met with our salesperson, Jordan, he was educated on how the installation of LeafGuard® Brand Gutters could address all of his concerns. He was so pleased with the product’s capabilities that he chose to have LeafGuard® Brand Gutters installed around his entire home and garage. Below are issues our gutter installation was able to address. When Wayne first reached out to us, he was most concerned with his garage’s gutters. Gutter Clogging: Having witnessed first-hand how quickly gutters on his home could clog without protection, Wayne made it a priority to partner with a gutter company that would offer a maintenance-free product. He was pleased to learn that LeafGuard® Brand Gutters have earned the Good Housekeeping Seal of approval. In addition, they come with a no-clog guarantee. Transferable to the next owner of his home, if for any reason Wayne’s gutters clog, it will be our team coming out to address the issue free of charge. Stained Fascia Boards: While unsightly, the stained fascia boards were visual evidence of serious issues that needed swift attention. The issue originated from the placement of the gutter’s support holes being below the maximum waterline. At times of heavy precipitation, the water level in the gutters would rise above the screw holes at the rear of the gutters, causing water to run down the face of the fascia. The end result was noticeable streaking. Failure to address this issue would have resulted in expensive damage to Wayne’s home such as a cracked foundation, washed out landscaping, and dry rot. LeafGuard® has an oversized trough and downspout, allowing it to handle over 32 inches of rain in an hour. This alleviates the worry of clogging. In addition, the system is custom-built for each home. Special care is taken to attach the gutters to home’s fascia board above the water line, eliminating the possibility of water leaking out the back of the gutters. Curb Appeal: Although the gutter toppers were a close match to the trough, there was still a noticeable difference in the colors between the two. As the years passed, the color contrast became even more significant. A fact that appealed to Wayne about LeafGuard® is that it is comprised of a single piece of aluminum, allowing the gutter and topper to match perfectly. "Your crew is thoughtful and polite." - Tom H.